Monera Carkos Vlado is the name of a fantasy empire in the Netherlands, a name that has associations with Slavic languages and could mean power of tsar. 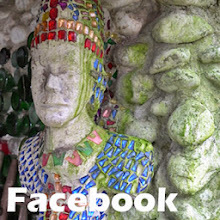 It is a realm created by dutch outsider artist Gerard van Lankveld (b. 1947), who lives in Gemert, a community in the Brabant area in the Netherlands. Van Lankveld hasn't any formal artistic training. His creative talent has developed in a very personal way. Already at the age of sixteen he began making various kinds of mechanical devices, a creative activity he has continued all his life, resulting in the creation of the most wonderful objects. Young Gerard withdrew into an own world of creativity also in response to the rather hostile treatment he got from other youngsters and adults in the community because he was considered to be "different". By creating his own world he was able to be a personality in his own way. In 1969, when he was in his early twenties, van Lankveld created the flag that would characterize his own world, the empire Monera Carkos Vlado. For one part this realm manifests itself in the objects he created, which are on display in and around his house. The interior has a large collection of all kinds of mechanical objects, instruments, clocks, ornaments etc, all constructed with a lot of ingenuity and creativity. At the outside van Lankveld has decorated the exterior walls, the roofs and the garden with various structures and decorative ornaments. He also constructed some colorful towers that raise high in the sky. His creations often show an affinity with eastern-orthodox architecture and Cyrillic orthography. For another part, the empire of Monera, of which van Lankveld is the self-proclaimed emperor, manifests itself through a national flag (with colours expressing various phases of development), currency, post stamps and textual elements inspired by Slavic languages. Some friends of van Lankveld had the honor to be appointed as dignitaries of the empire. So there is a secretary of state of food and drinks, a dignitary who authors a website in dutch about food and drinks, with recipes for excellent meals. Initially van Lankveld made his creations and constructions just for himself and not with the idea to expose them. In recent years however interest in his work has grown and he has been asked to participate in expositions. So in 2005 a number of his creations could be seen in the group exposition Verborgen werelden (Hidden worlds) in the Guislain museum in Gent (Belgium). A selection of his creations is permanently exposed in this Belgian museum, which focuses both upon outsider art and the history of psychiatry. In 2007 museum 't Oude Slot in Veldhoven (Netherlands) had an exposition of Lankveld's smaller objects. 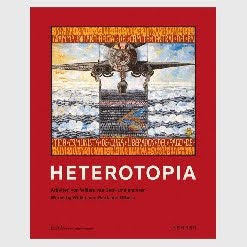 In the summer of 2008 the Deutsches Architekturmusem, Frankfurt, had an exposition entitled Heterotopia, that showed works of van Lankveld, together with creations of Willem van Genk, Stefan Häfner, and others (Heterotopia is an expression introduced by Foucault, referring to parallel social worlds). In 2009 Gerard van Lankveld participated in the exposition Backyard Genius in Kemzeke, Belgium organised by the Guislain Museum and the dutch Collectie de Stadshof on the premises of the Belgian Verbeke Foundation. 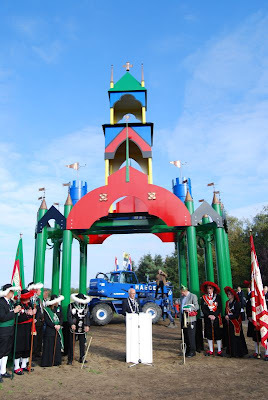 The community of Gemert, where van Lankveld lives, commissioned van Lankveld to design a monument to decorate the western entrance of the community. It became the Klaïda, kind of a tower, which was installed in the autumn of 2007. The picture below shows the official ceremonies, just before the creation was completed with a cross on its top. A dutch foundation, Stichting Monera, presided by Ton Thelen aims to promote and protect Lankveld's creations. * Pictures of van Lankveld at work on the website of Frank Brouwers, a photographer from Gemert. Hi Owen, wish you a nice springtime too! I don´t know what you think dear Henk, but i consider it to be a delightful satire of state and nation burocratic concept. Extroaordinary and nice that there are lot of pictures and material of all kind on it. Wish you as well a great spring!